As the world around us is constantly evolving and newer technologies make everything faster and more convenient, it is natural that payments are also changing. When you are looking at the payment options available at reputable virtual casinos, you will notice that sometimes there is the option to use Apple Pay. Despite being a rather new payment solution for casino fans, it does offer some perks that cannot be found anywhere else. Thanks to this payment option, Apple users will have a very convenient and secure way to top up their gaming account. The service is available on the majority of iOS, Mac and Apple Watch devices. Virtual players who utilize Apple Pay are enabled to control their gaming funds with just a few taps on their smart device or computer. The whole process of using Apple Pay for deposits at online casinos is extremely easy and it offers security that cannot be seen with other payment solutions. Before you start topping your gaming account via this method, however, there are several things about the service that you need to be well aware of. This will guarantee you that you can make proper use of the perks that Apple Pay is offering. We can compare Apple Pay in a way to the service that e-wallets are offering. This is a mediatory service which allows you to pay with your credit or debit cards but without exposing any of your card details. This instantly makes Apple Pay a very secure option when it comes to boosting your casino balance. Prior to using this payment solution, you will have to save your credit and/or debit cards at the Wallet app of your device. This will help you to set your Apple Pay account and will give you the opportunity to boost your casino balance instantly. Before saving your card on your Apple device, you must make sure that your card issuer supports the service of Apple Pay. You should also be utilizing a device that runs on the latest version of iOS, watchOS or macOS. You will also need your Apple ID so that you can set your Apple Pay. For those who are using iPhones and iPads, there is also the option to scan your card, instead of manually entering its details when saving it to your Wallet app. After typing the details of the card you wish to add, you will be connected to your banks which will have to approve your request. Once this is done, you are ready to use Apple Pay at online casinos. In addition to using credit/debit cards, US citizens also have the option to set up an Apple Pay Cash card. They can upload funds to this card and also use it for purchases online and offline. Thanks to this option, Apple users can also request and receive payments via the message app. The money that they get is transferred to their Apple Pay Cash card and they can easily use their available funds to pay for various services and purchases. Whenever you are ready to make deposits at an interactive casino, just head to the Cashier and select Apple Pay from the listed payment options. Then you should enter the amount you want to deposit and select the button “Apple Pay”. After this step, you will be asked to confirm the transaction either via the Touch ID or the Face ID feature of your device. The Touch ID feature requires you to press the Home button of your device with your finger which will quickly authenticate the payment. If you are using iPhone X or a newer version, you will be able to use the Face ID feature which scans your face whenever you want to verify a payment via Apple Pay. Once you have confirmed the deposit you initiated, your money will instantly appear in your gaming account. This is great news for players who do not like to wait and are eager to start wagering real money online. The fact that you are not asked to provide your card details or any other sensitive information while making casino deposits, makes Apple Pay a very secure payment solution. Unfortunately, this service can only be used for topping up your gaming balance. This means you have to look for an alternative method when it comes to your casino withdrawals. When we are comparing the positive and negative qualities of Apple Pay, there are definitely many perks that virtual players may enjoy. By comparing the advantages and disadvantages of Apple Pay, you will be able to decide whether this payment option is suitable for you. When we are taking a look at the perks that this deposit method provides, its simplicity is definitely on the top of the list. Whether you are playing on your Macbook, iPhone or iPad, you will be able to complete your casino deposit in just a few taps on the screen of your Apple device. The payment itself does not require many steps and the authentication process is just as easy. The speed of transaction is yet another benefit of using Apple Pay for funding your casino balance. Whenever you initiate a deposit via Apple Pay, you will simply have to confirm the transaction via the Touch ID or Face ID function. Since this takes only a few seconds and you do not need to take any other steps, you can see your money in your casino account instantly. This allows you to fund your gaming balance and start making bets right away. Since we are on the topic of Apple Pay’s strong points, we cannot miss mentioning the security it provides. The way this payment system is designed is to protect its users. Even though, in a way, you are still using your credit or debit card to make payments online, you do not expose your card details to anyone. This gives you additional protection when you do not feel comfortable sharing any sensitive information with online casinos. Since your credit/debit card details are not saved on your Apple device, you can also be sure that there is no need to worry about someone taking advantage of your cards. One of the main things that players are taking into considerations is whether there will be additional charges for utilizing a certain type of payment. For those who have resorted to casino deposits via Apple Pay, the good news is that there will be no surcharges imposed by the virtual casino. When it comes to the disadvantages of the service, there are certainly not that many downfalls of using Apple Pay at interactive casinos. This being said, you might have a difficult time finding virtual casinos that accept payments via Apple Pay. This is because it is a fairly new payment service, especially when it comes to handling deposits at online casinos. Despite that, more gaming websites start accepting payments via Apple Pay. The one thing that may be considered as a pretty big disadvantage is the fact that players can only make deposits via Apple Pay. Since the service does not support withdrawals, you will have to resort to a different payment method when you are eager to cash out your casino winnings. Lastly, we can list the obvious disadvantage of the service’s accessibility. If you are not an Apple user, you will not be able to use this payment service. This means that not many casino members will be able to top up their gaming balances via Apple Pay. What is more, the service is not available worldwide which may force some players to seek other payment methods. As it was mentioned earlier, one of the best things about Apple Pay is that it does not impose any additional charges when you are depositing money to an online casino. This is great news for virtual players as often casinos charge some extra processing fees, depending on the payment method that is utilized. This, however, will not be the case when you use Apple Pay. If you, however, have the opportunity to utilize an Apple Pay Cash card, you might have to pay some fees for funding this virtual debit card. You can use the cards you have already saved in your Wallet app to upload money to the Apple Pay Cash card. If you decide to use a debit card to transfer money to your virtual card, you will be charged no fees. Whenever you decide to upload funds to your Apple Pay Cash card via a credit card, however, you will have to pay a fee of 3%. Despite this small fee, sending and receiving money via Apple Pay is free of charge. Whenever you are looking for a payment method that will allow you to play for real money right away, you can definitely trust Apple Pay. This is an extremely fast way to boost your gaming balance and experience no risk while doing so. The reason for the deposits via Apple Pay being so time-efficient is the simplicity of the payment method. You will not have to waste your time filling out of transactions forms, providing your card details or use passwords and user IDs in order to log into your online banking account. Not only can you use Apple Pay while playing on a mobile device, but you can also use it directly in apps. This means that whether you are using the Safari browser app of your device or you have installed the application of your favorite casino, you will be able to make Apple Pay deposits with just a few taps on the screen. The payment process is the same as when you are making deposits on the web-based version of the casino. Whenever you are initiating an upload of funds at a mobile casino, you will yet again be able to use the credit/debit cards you have saved in your Wallet. Not only is Apple Pay suitable for mobile payments, it is in fact, designed with exactly this idea in mind. Thanks to the Touch ID and Face ID features, you will be able to finish any transaction on your iPhone or iPad in a few seconds. What is more, the payment process will be properly secured and you will not have to worry even when playing on the go. The best thing about this service is that you will not need to download any app on your iOS device in order to be able to use Apple Pay. It is available on the majority of Apple devices and allows users quick and easy payments without any hassle. If you are playing at a mobile casino app, you can simply go to the cashier section and select Apple Pay as your preferred deposit method. After entering the amount you would like to deposit, you might be asked to double tap the side button if you are using a newer version of iPhone. This will automatically activate the Face ID authentication and your money will be transferred to your gaming account instantly via Apple Pay. For users with the Touch ID feature on their devices, all they will need to do in order to confirm the transaction via Apple Pay is to rest their finger on the Home button. 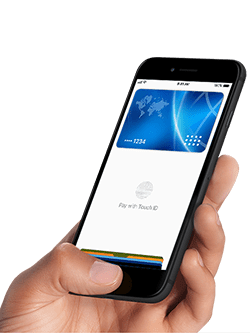 The simplicity of the method only proves that Apple Pay is excellent not only for in-store payments but also for making quick transactions in mobile apps and at various websites. This is great news for gambling fans who enjoy playing on the go. One of the main reasons why many players find Apple Pay very convenient is the security it provides. Simply using your credit or debit card at a virtual casino for deposits will require you enter your card details which are then saved by the website so that you can use them again in the future. Meanwhile, if you resort to uploading funds via Apple Pay, you will still use your credit/debit card but you will not expose any sensitive information while doing so. This will allow you to remain anonymous while making deposits at the online casino of your choice. Whenever you are verifying your transactions via Apple Pay, you have to use a passcode you have set before using the service. However, you will most likely be using either the Touch ID or Face ID feature of your device to authenticate the deposit you are making at an online casino. If you set up a more complicated passcode, it will be hard to crack and you will increase the safety of your payments. Alternatively, the Touch ID and Face ID features allow you to be the only person who will be able to authenticate your payments via your Apple device. Even though you are saving your credit/debit cards to your Wallet app in order to be able to use Apple Pay, you do not have to worry about someone taking advantage of your card details. This is due to the fact that this type of sensitive information will not be stored on your device and even when you pay via Apple Pay, your details will not be shared with a third party. To further improve the security levels of Apple Pay, the company is using encryption technology to protect the data that is shared during transactions. This gives you peace of mind whenever you are using Apple Pay for your casino fundings. You will be able to use the service of Apple Pay on iPhone 6 or above, iPad mini 3 or a newer model, all series of Apple Watch, Mac devices launched after 2012 or Mac models that support the Touch ID feature. What are the Apple Pay Deposit Limits? Depending on the virtual casino, the deposit minimum for Apple Pay users may range between $5 and $20. This being said, prior to depositing money, you should check the deposit limits that apply to the gaming website where you play. Can Apple Pay Be Used for Withdrawals? Although Apple Pay does, in a way, resemble e-wallets, it does not offer the same type of payments. This is why, currently, the service can be used only to top up your gaming account. Despite that, it is a very secure deposit method. Are There Many Virtual Casinos Accepting Apple Pay? Unfortunately, the number of online casinos that will allow you to utilize Apple Pay is limited. This being said, there are more gaming websites which see the potential and convenience of the payment method. This means that the number of casinos where you can make Apple Pay deposits will continue to grow. Can I Use my Apple Pay Cash Card at Virtual Casinos? This is a bit tricky since only US citizens are allowed to use Apple Pay Cash. Meanwhile, the virtual gambling scene in the country is rather complicated as online gambling is illegal in most states which means that you most likely will not be able to use Apple Pay Cash for your interactive casino deposits.